After the fun that was the Corvette weekend, Brian left for Olympia to work while I took Cory home... for one night! Then I left him with my parents and flew off on a crazy California adventure with some girlfriends from high school. We left Monday night after Jamie got off work and got to Seattle about 9pm. Staying at Kelly's uncle's house so that her dad could get us to the airport at 4am... yeah, we had a flight leaving at 6am and no, I did not choose that! No worries until it was time for bed. Jamie sits down on the bed and says "this is a brick". I'm thinking, okay, so it's harder than normal. No, it's really quite literally a brick! When I sat down the bed did not give at all. It was like sitting down on a wooden park bench! Thankfully I always travel with an extra pillow so that helped, but... between the brick bed and having to get up at 2:30am (because some people take over an hour to get ready no matter where they're going - and no, that's not me) there was not a whole lot of sleep to be had! Getting to the airport and on the plane was no problem even though I was flying stand-by. However the seating arrangements were quite amusing. Jamie and Kelly were together and I was one row back across the aisle seated amongst 5 ladies who apparently were traveling together. The row behind us was entirely empty so after their musical seats it turned out that I had a row to myself and the seat next to Kelly and Jamie was also open. So without even having to say anything I got to sit by my friends. Not that it really mattered since we all tried to sleep the way there. Arrival in LA was at like 9am and after picking up the rental car we were ready to go. Our hotel was just blocks from Disneyland, but who lets you check in at 10am? 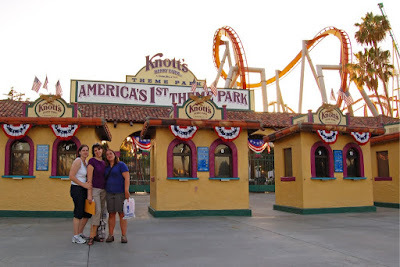 After fighting with the gates in the parking lot (I guess they really don't want other people to park there) we decided to go to Knott's Berry Farm for the day. Not too far out of character for Kelly actually. We chose to go on the wooden roller coaster called The Ghostrider first. Also the first mistake. Since it's wooden it doesn't go upside down and all you get is a lap bar. I guess I didn't get mine tight enough because every time we went down (and there were a lot of those!) I was about 6 inches off my seat. Talk about scary! The best part was Jamie sitting behind me and going ah, ah, ah, ah, aaaah, ah, ah, ah, aaaaah, the whole ride. We kidded her about that for the rest of the day! 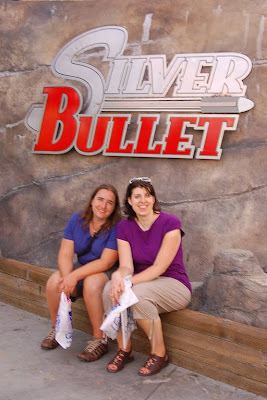 The best ride we found was called the Silver Bullet. It's like the Batman ride at Six Flags where you hang and your feet are free swinging rather than sit in a car. It was so smooth and fast it was awesome! The only not awesome part was the very last circle that was so tight your feet were tingling from all the blood rushing to them. 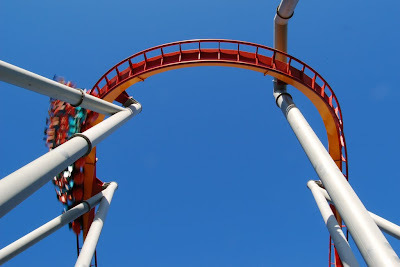 And after going on the ride twice in a row (there was no line) we all kind of had head aches from lack of blood to the brain! 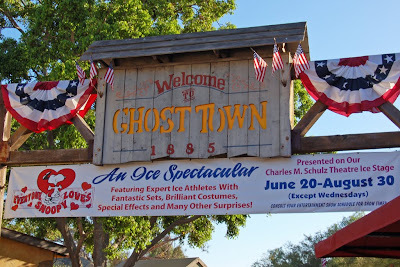 The other really cool part about the day was seeing the Everybody Loves Snoopy ice spectacular. It was in a theater, but the stage was an ice rink with a walkway around the edge - a semicircular bit that stuck out into the audience. There were about 20 college age skaters, very professional, and then half a dozen Peanuts characters... on skates! And they were doing more than just skating around too. The show was only half an hour, but it was fabulous! I was so impressed with the choreography and the way they tied it all together. It was very fun, and a good rest in the afternoon for us! 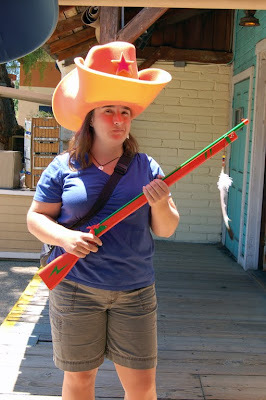 After a few more rides we were all done in and Jamie was feeling a little ill. So we headed back to our hotel to meet up with the 4th member of our posse, Julie, who lives in LA now. Room service was had and then to bed to get ready for a full day... but who ever heard of a hotel room that still has double beds? Craziness! Which did not help our sleeping! How fun! It's been so long since I've done a girls-only outing!